The title of this post is a tweet that has just been posted by Lisa Lane. It so perfectly describes what is happening on the Pedagogy First programme that I have pinched it for this post. The Pedagogy First programme has only just started and I already find it to be full of contradictions. Lisa has described it as a MOOC – actually a SMOOC (i.e. a small MOOC), but I’m beginning to realize that this is misleading. The actual course site doesn’t refer to MOOCs. 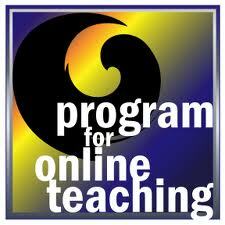 It is in fact an open online course, so more structured, more teacher led, more prescribed, less messy etc. than my understanding of MOOCs. The programme has been designed to be open, but I’m also beginning to realize that a ‘constrained’ and ‘structured’ openness is what is required. There are good reasons for this, mainly related to helping ‘novices’ to settle in. It seems that ‘open’ in relation to this course has a specific meaning, i.e. open and free to the world to join in, but not ‘open’ enough to cope with the diversity of opinions presented by a diverse mix of novices and experienced online learners. Experienced online learners are nowadays very likely to have ‘MOOC’ experience and be influenced by this, whereas novices will have neither online experience nor MOOC experience. The programme requires a weekly blog post, tagged with ‘potcert’ which feeds into the course site. In a recent blog comment Lisa describes her blog as ‘I try hard to keep in mind it’s my blog, like my house. People can stop by, but they don’t live there like I do’. This is how I think of my blog – my domain to write what I want, but it seems that there are restrictions on what we can write if our post is to feed into the Pedagogy First course site, for example, we are urged to keep our posts short, to not use ‘jargon’, to not discuss things that might be ‘jumping ahead’ in the syllabus, to focus only on the tasks required by the syllabus, to not post anything controversial. If we want to do this, then we should not tag our posts with ‘potcert’ even if we think the topic is related to online pedagogy. I have worked on enough online courses and MOOCs to understand the dilemma and to recognize that novices can easily be scared off. In my last post I wrote that veteran MOOCers may need to hold back a bit – but that has to be their own decision. My decision following this discussion and now that I understand how the Pedagogy First course works, is not to tag my posts with ‘potcert’. I don’t think it works to tell bloggers what they can do on their own blogs, particularly if they have been blogging for many years. Also should we expect some to limit their thinking and writing while others catch up? How would you feel if your child was experiencing this at school? Maybe a better approach is to focus on the novices, i.e. get the mentors working with them from the word go (my understanding is that the mentors haven’t started yet), make posts which explicitly state what the nature of open courses is, tell them to expect to be confused and find it overwhelming, tell them to pick and choose and so on. Only two days in and this course has already raised so many issues. I think Lisa is right – the course is currently between a MOOC and a hard place. I wouldn’t be surprised if many online courses begin to experience this as MOOCs become more commonplace. I have been told twice, very recently, and quite often in the past – that I am a glass half empty person. In other words I am a pessimist and the implication is that this is not good. Good would be (I have been told) – to be a glass half full person – an optimist. I have thought about this a lot – as you do when you feel that you have been criticised – and I honestly don’t feel that the criticism is justified – not because it is not true – it is (I am definitely a glass half empty person) – but because I think there is real value in being a glass half empty person and especially in relation to reflective learning. For me being glass half empty means that I am usually prepared for the worst – so ahead of time I carefully analyse situations, I go through everything with a fine toothcomb, I try to anticipate what might go wrong. I also try to surface assumptions, I ask critical questions and I really can’t be doing with ‘appreciative inquiry’! I come from a science background and science progresses not by proving things but rather by disproving. I strongly believe in learning from mistakes and that as an educator/teacher/learner I have to try and ensure that I, and those I learn with, are not afraid of failure. There is plenty of research to show how inhibiting fear of failure can be. For me a ‘can do’ attitude comes from knowing, through careful analysis and preparation, that it can be done! To reflect on your overall experience to date as a teacher; what kinds of students have you taught, what have you discovered from the experience, and what have you most enjoyed in your teaching? I may not actually do this activity but it’s interesting to think about how I might approach it if I did? Being a glass half empty person, to complete this activity I would probably select a critical incident in my teaching career (and there have been many :-)) and analyse why it was a critical incident and what I learned from it. To do this I would need to do more than simply describe the event – I would need to critically analyse it, looking at it from a number of different perspectives – my own, those of the learners involved, my colleagues and the literature – as suggested by Stephen Brookfield’s four lenses. But how would I know that my analysis was critical and not simply descriptive? Jenny Moon’s writing on this has been significant in developing my understanding. In her book ‘A Handbook of Reflective and Experiential Learning: Theory and Practice’ she includes a number of exercises to help learners develop their reflective learning skills and abilities. One of these activities (which is freely available on the web – search for ‘An example of a graduated scenario exercise – ‘The Park’ A means of introducing and improving the quality of reflective learning’) provides three accounts of a critical incident in which each account becomes increasingly reflective. Jenny Moon then describes the shifts that occur in deepening reflection. 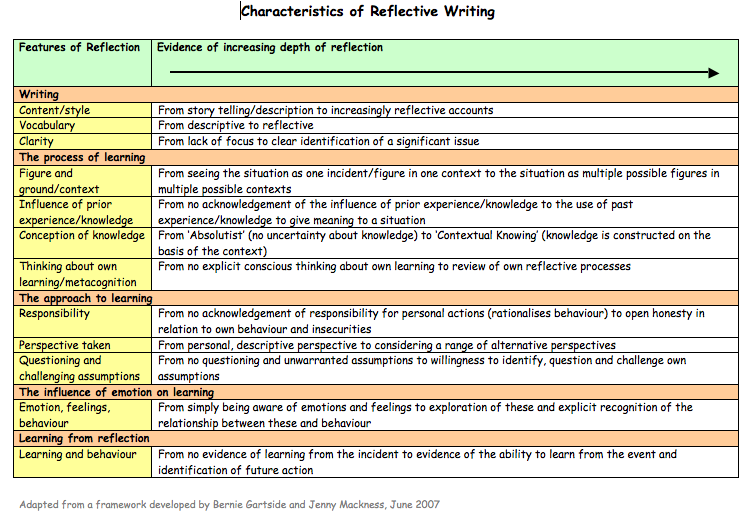 When I worked on Oxford Brookes’ online reflective learning course as a participant in 2007 (and Jenny Moon is a tutor on this course), with another participant Bernie Gartside, we explored these shifts in detail. I have summarized our work in the diagram below. (Click on the image for a clearer view). So in my analysis of the critical incident I selected, I would hope to see some of the characteristics described in the diagram above. And finally, what I have learned from John Mason, who writes about the teaching of mathematics, in his book – ‘Researching your Own Practice: The Discipline of Noticing’ – I know that I am unlikely to ‘notice’ changes in my learning unless I ‘mark’ them in some way. There are many ways of ‘marking’ learning, especially these days with multimedia at our fingertips, but my blog serves this purpose as I explain in this video, which is also posted on the #fslt Moodle site. From my perspective this has been one of the most difficult aspects of organizing the technologies we are using for this MOOC. How should we do the aggregation and where should the aggregation appear? Ultimately the decision was to aggregate the blog feeds into our WordPress home site. I wasn’t involved in setting it up, but I have been interested in the discussions around what to do and how to do it. I have been aware for some time of Stephen Downes’ grsshopper aggregator which he openly shares in detail, but recently I have become aware of the Planet Aggregator . This project has raised some very interesting issues, most notably the issue of tagging. We didn’t want to pull in authors, so much as the posts that relate to communities of practice of specific authors . Obviously people blog about a variety interests, some of which wouldn’t be relevant to this blog stream. We discovered that some people don’t use tags at all, even if they write good posts on communities of practice. Others (me included) are inconsistent in their use of tags or use a variety of tags to represent posts on communities of practice. So discussions at the moment are around whether or not only ‘invited’ people can submit their blog to the aggregator and then whether they should be required to use a given tag, for their blog to appear in the stream. This has led to a further discussion about boundaries. CPsquare has a ‘permeable’ boundary. It has some aspects of it’s work ‘open’ to the world such as it’s wiki and it’s website , but it also has a private members area where there are ongoing private conversations. Members pay a membership fee. So the question has been whether any of those conversations should appear on the aggregated blog stream, or whether only members should be invited to submit their blogs to the stream. I think the idea is that the stream will include ‘trusted’ friends who write about CoP related issues, but are not necessarily paid up members of the community. The suggestion from Mel has been that CPsquare will need a ‘planetmaster’ to manage the invitation of subscribers. Although a lot of hard work has gone into looking through members’ blogs for relevant tags and categories, Mel and John Smith (community steward for CPsquare) seem to have been able to set up a demo site in a relatively short space of time – so it would seem that aggregation of blogs might be easier in the future – maybe even for non-technical people like me? ……there has actually been some discussion about The Selfish Blogger Syndrome, which I would like to respond to with this post. This made me sit up and think. When I look back over my posts, some of them have generated discussion, but not many and not much depth of discussion. On reflection I find blogging just a bit too distant for discussion. I value it for reflection and thinking things through, but for me discussion – in the deeper sense – happens in smaller more intimate groups away from the public arena. So my most valuable discussions happen via email or on the research wikis I am working in. Very often a question might be raised in a blog post or an online session – but the discussion continues elsewhere out of the public eye. So Heli – to answer your question – I wasn’t really thinking in terms of hierarchy, more of depth of discussion – and for me, rightly or wrongly, that tends to happen in locations other than my blog. I do think that postings in small isolated blogs *can* be integrated into larger discussions. And I would go further to add that if we believe in open, networked learning then we *should* strive to make that integration as effective as possible. I think Tony’s comment is probably worthy of a research paper and certainly further thought and investigation. And Alan – Yes I always allow for pingbacks on my blog; I also subscribe to comments RSS feeds and I try to provide links to other people’s blogs within my post – but I find myself in a dilemma in the striving for integration. If I am writing about an event that needs (in my mind) to be advertised, then I am happy to click on the FB, Twitter, Google+ links at the bottom of the blog post and broadcast it. But if it is just my post, simply for me, like this one, then it doesn’t feel right to broadcast it. I get feelings of ‘who am I to push this post out into the webosphere?’ It makes me feel uncomfortable. So I don’t do it, but I am very happy if someone ‘visits’ me here. I just don’t want to push myself on people. Blogging alone feels like enough of a push. Overall, I don’t think I would enjoy this mooc (change11 ) nearly as much if I only used one tool to ‘discuss’. To respond to Nancy White’s question during the #socialartist live session yesterday, I seem to use five sources and that’s as much as I can manage (The Daily everyday plus Twitter, FB, SharePoint and my blog less frequently). And that brings me back to my starting point. How much of this, i.e. Twitter, Facebook etc. is really discussion. For me a real in depth discussion takes a considerable amount of trust – especially if I am ‘discussing’ with people I have never met and have no physical gestures etc. to get a sense of them. My experience has been that in depth discussion usually takes time to develop and for me has extended long after the MOOC ends. Some of my CCK08 discussions continue to this day. This reminds me that Etienne Wenger writes about the shared repertoire of a community of practice and that community members need to develop a shared history. I definitely need a sense of shared history to feel comfortable with in depth discussion. Thank you to Jaap, Heli, Alan, Tony and brainysmurf for prompting me to dig deeper into my understanding of what it means to be a selfish blogger and the extent to which discussion can be promoted through blogs.